Jessica Simpson travels the world to find out what is beautiful in her new show for VH1 The Price of Beauty. She's been out of the public eye after her mom jeans controversy. However, Jess has been a busy girl with her fashion line that earned her 20 million dollars in profits last year. Also her new show puts her back in front of the camera for more reality show antics. It was World Sleep Day recently. We spoke to experts and found that just a few were aware of the day, while the rest welcomed it! For those of you who want great pair of legs we have some easy yogasanas which will ensure that you too have those million dollar legs. Utkatasan: Stand up and bend your knees slightly. Take your hands behind your head and pulse down. This asana strengthens the ankles, thighs and shapes the lower muscles of the body. Vrikshasana: Stand up and bring your left knee on to your right thigh. Keep your eyes focussed on one point and slowly bring your hands up and balance yourself. This asana is beneficial in strengthening the ankles and knees. It also improves your concentration. Veerbhadrasana: Keep your legs wide apart and your hands straight. Point your right toe towards your right hand and bend towards the same side and look at your hand. Repeat it on the other side. Moordasana: Open your legs as wide as you can and bend down and touch the ground. Come up slowly. A word of caution for those of you having a knee pain. Do get in touch with a doctor before doing these exercises. Models turn on the heat at a lingerie show in Mumbai, showcasing latest designs for the upcoming spring/summer season by international brand Triumph. From flab to fab...in 21days! The gauntlet has been thrown. Anybody can now lose upto 10 kilos using a revolutionary new weight-loss programme in a special High Altitude Chamber over just 21 days. The programme’s called Qi Train 21, named after Qi Lifecare — the trendy and happening gym and wellness centre at Eros Cinema building, Churchgate. Obese people who have given up on all conventional weight-loss methods, others wanting to lose inches, are advised to get on the programme. Qi Train 21 works on hypoxia, a condition caused at high altitude where the oxygen is so sparse, that even little exercise leads to increased cardiovascular fitness and accelerated fat loss. Medical science recognises that mild and non-damaging intermittent hypoxia, such as this program, is used intentionally to develop athletic performance. Marathon runners, cyclists and boxers have all pushed their bodies at high altituides to successfully train for competitions. Happily for you, there’s no need to go climbing mountains to lose weight, the High Altitude Chamber at Qi Lifecare (in association with John Gloster, the Australian cricket physio for Team India) is ideal for this. Though situated on the first floor, it simulates altitudes of upto 15,000 feet or 5,000 metres above sea level. You cannot exercise here at the same intensity as you would in a regular gym. The heart and lungs are encouraged to pump harder. The hypoxic air enhances the efficiency of the body’s respiratory, cardiovascular and oxygen utilisation systems, apart from stimulating the fat-burning process. And in 30 minutes, you would burn double the number of calories than a conventional workout. The Qi Train 21 program comprises 21 half-hour sessions over five weeks. The training is exciting and not very strenuous. It is supervised by American College of Sports Medicine-certified trainers and includes the internationally-renowned Vibrogym that conserves and builds muscle mass even as it promotes fat reduction. Every workout is based on individual heart rate parameters and created only after an extensive pre-program physical evaluation. Qi Train 21, Qi Lifecare, 1st Floor, Eros Cinema Building, West Wing, Churchgate. A plus size model wears a creation as part of Elena Miro's Spring/Summer 2008 women collection in Milan. Elena Miro, which is presenting its fourth collection at Milan, designs for women sized 42. 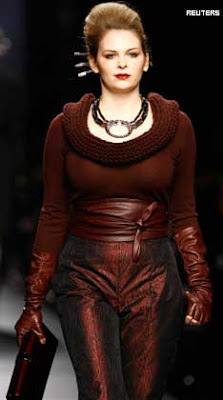 A plus size model presents a creation from the Mark Fast 2010 Autumn/Winter collection during London Fashion Week. A plus size model displays a creation of Italian design house Elena Miro during a Spring/Summer 2006 Milan Fashion Week show in Milan. A plus size model displays a creation as part of Elena Miro's Spring/Summer 2010 women's collection in Milan. A plus size model prepares backstage before the presentation of Elena Miro's Fall/Winter 2008/09 women's show at Milan Fashion Week. A plus size model presents a creation as part of the Elena Miro' Fall/Winter 2010/11 Women's collection during Milan Fashion Week. A plus size model displays a creation as part of the Elena Miro Fall/Winter 2009/10 women's collection during Milan Fashion Week.